It has been a week since our last post. We are now just about to start the constructions inside vonblum. We have taken out the fridges, the draft beer machine and are finding uses for many other things to be found inside the space now. Hopefully, by next week we can start tearing the walls down and getting closer to what we imagine the space to look like. Another reason for not having posted was a quick trip to the lovely city of Hamburg. 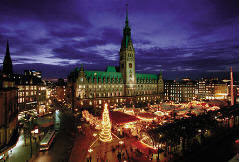 The Christmas markets where all being set up and you could feel that spirit all over the town. Met up with friends and family, wandered the city in search of inspiring ideas for vonblum, and found some nice products to be part of our space.